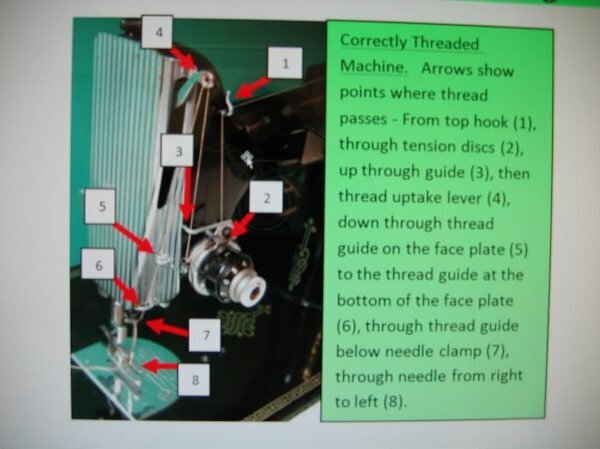 A small sample is shown here of the Basics Card with crystal clear full-color photos covers threading, needle position, winding a bobbin, reverse stitching for locking in your seam, beginning stitching, etc. Many Featherweight owners use their machines infrequently when they go on retreat or travel. I have many emails and requests for help because they have simply forgotten some of the unique things about the Featherweight, and as a result they can't get their machine to sew. This card is 8 1/2" x 11" and made of heavy weight laminated card stock and is designed to fit in the front of your Featherweight Case so it is always easily accessible when you need a reminder. This card will also be invaluable when you are ready to pass your beloved Featherweight on to a grandaughter or other family member.